Hello All, I have been behind in my posts and creations lately. My Christmas gifts are coming along and I will post soon! I have been writing away each day as a participant of National Novel Writing month and I am just over 30,000 words since November 1st! Half way to the 50,000 word goal before November 28th. Such fun! Here is a little ornament (Oh no!....blue again!) I whipped up this morning. The sun peeked out for 30 seconds today, so this is a dim view. She really is quite sparkly. I was inspired by Nancy Maxell James. 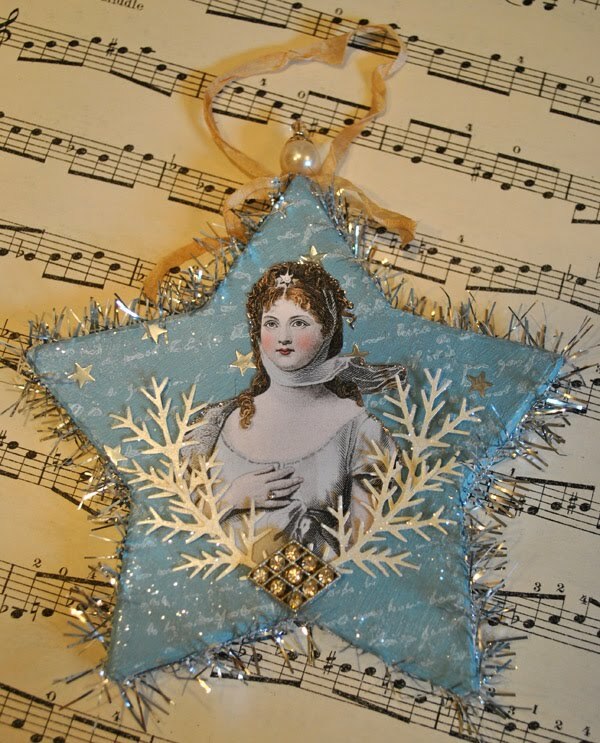 If you visit her site you can see her gorgeous star ornaments. Both her and I used Paperwhimsy images, and the tinsel on my star is also from there. Thank you Nancy for sharing your creativity! This time of year with Thanksgiving just around the corner, I begin to become more conscious of all my blessings. I am thankful for my Dear Husband, my cherished Children, our lovely home, the sweet friend here and online. I am grateful for the connection I feel expressing myself with art. I am thankful for you! Oh!!! I adore this, such beautiful work. I haven't made anything with paper for a month or better, just can't get into it at the moment. Ps. Thanks for reminding me how much I love vintage. I will have to do some for the holidays! Thank you Ladies! I love it when you stop by! I really am thankful for you and how supportive you are. wowsers! I love your gorgeous star...the image is so perfect and thank you for your sweet comments...aren't they fun to make? I hope you have a wonderful Thanksgiving! I love the star ornament... I bet your house will be beautiful at Christmas with all your lovely decorations.